19-year-old Peregrine Hawthorn from Seattle was born without fingers on his left hand. In 2013, he learned how to 3D print and build an affordable mechanical set of his own. Hawthorn has paired up with e-NABLE, an online community of 3D printing makers that creates affordable prosthetics to help those in need of their services. 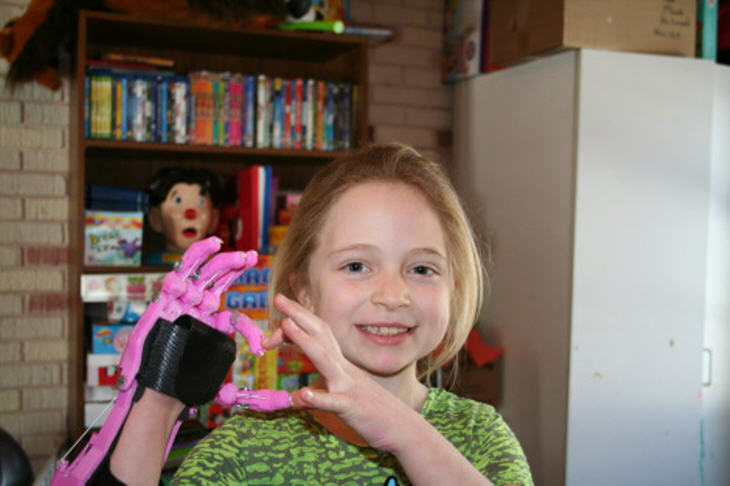 E-NABLE was created by Jon Schull, a researcher of the Rochester Institute of Technology to connect 3D printing enthusiasts with people who need affordable prosthetics. Schull created e-NABLE in 2011 when he realized that although many engineers were creating prosthetics for local people in their community, there was no community to develop and distribute their efforts. E-NABLE was originally an interactive map to connect hobbyists who wanted to volunteer to help others. Currently, over 300 members from all over the world are part of the e-NABLE community. Members help new makers to learn the building process of prosthetics and will also print parts for those in need. Members also post open source design files and help each other improve their devices. Schull will travel to the Science Online Conference in Raleigh, North Carolina on March 1st in a discussion called “Creating Collaborations across the Wide World with the Web.” Shcull will co-host with Nick Parker, a high school student in Silicon Valley and a fellow member of the e-NABLE group.